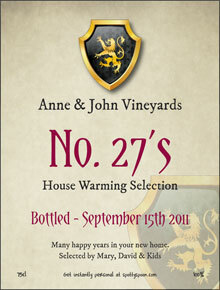 New Home Wine Label. Going to a Housewarming? Mark that special moment in a friend's life. "Here's to many happy years in your new home." Either going to a house warming celebration or just for someone who has recently moved house/home, make a fun gift to mark the moment with style. Moving home can be a difficult time, but who would not love to settle in on their first night with a bottle of personalised wine to celebrate the event. We find that people given our gifts will hold onto the empty bottle as a keepsake - so your thought will be remembered for a long time after that special day. Note - The main wine name can be lots of things over the two lines 'Chateau (Surname)', 'No. (House Number eg 34) Selection' 'The (Initials eg T&H) Vineyards. (First Name eg Kevin's) Place' etc. I have used the site before for a friends 40th and then for a new summer house with mini bar for wine... Both people loved their presents, and I loved giving it!